The euro today extended its decline against the US dollar as investors reacted to more disappointing releases from Germany, which is the EU’s largest economy. The divergence in economic growth trajectories between the US and the EU continues to weigh on investor sentiment towards the EUR/USD currency pair affecting its performance. The EUR/USD currency pair today fell from an opening high of 1.1368 to hit a low of 1.1330 in the mid-European session. The currency pair traded in a tight range during the Asian session before heading lower in the European session as the selling pressure intensified. The release of the German industrial production data for December contributed to the pair’s decline as the print missed expectations. According to the Federal Statistical Office, German industrial production fell by 0.4%, which was a large decline as compared to the expected 0.8% expansion. The annual print also missed expectations by 0.6%. The release of the European Central Bank‘s economic bulletin later also drove the pair lower despite markets generally ignoring the report. 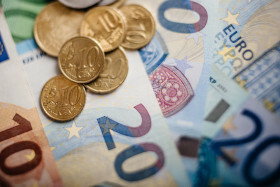 The selling pressure on the euro increased when the European Commission published its Winter 2019 interim economic growth forecasts. The report cut the overall GDP growth forecast for the eurozone from 1.9% to 1.3%, while Italy’s economic growth was downgraded to just 0.2% from the original 1.2% projection. Germany’s forecast was also trimmed from 1.8% to 1.1%. The currency pair’s future performance is likely to be affected by the release of the US initial jobless claims report later today and by investor sentiment. The EUR/USD currency pair was trading at 1.1334 as at 11:07 GMT having fallen from a high of 1.1368. The EUR/JPY currency pair was trading at 124.54 having dropped from a high of 125.07.